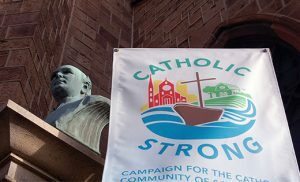 A Catholic Strong banner outside the Cathedral of the Immaculate Conception, Camden. 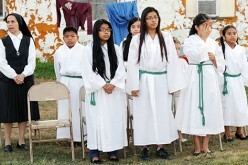 The cathedral and two other parishes have recently surpassed their goals. 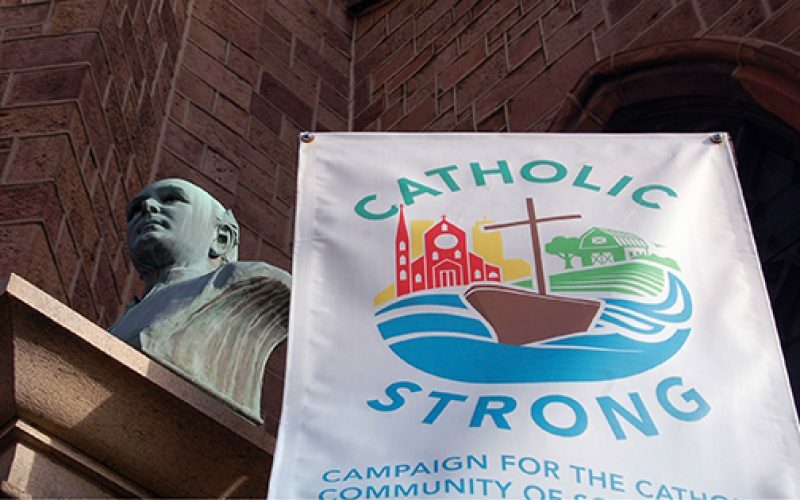 Three more parishes in the Diocese of Camden have reached their Catholic Strong goals, thanks to hardworking parish campaign teams, and generous faithful parishioners. Mater Ecclesiae Chapel, Berlin; the Cathedral of the Immaculate Conception, Camden; and Mary, Queen of All Saints in Pennsauken will receive 70 percent of their goal funds raised to go toward their own parish projects, with 30 percent going to the Diocese of Camden and its outreach to the six counties of South Jersey. As well, 80 percent raised above the parish’s goals will return to each community. “I’m humbled by parishioners’ generosity,” remarked Father Edward Friel, pastor of Mary, Queen of All Saints. With a parish goal of $370,000, to date his church has raised $470,720 through traditional fundraising tactics such as phone calls, personal visits and in-pew solicitations. As with all parishes during this Catholic Strong campaign, Mary, Queen of All Saints has outlined its needs, informing its faithful in the pews exactly where their money will go. 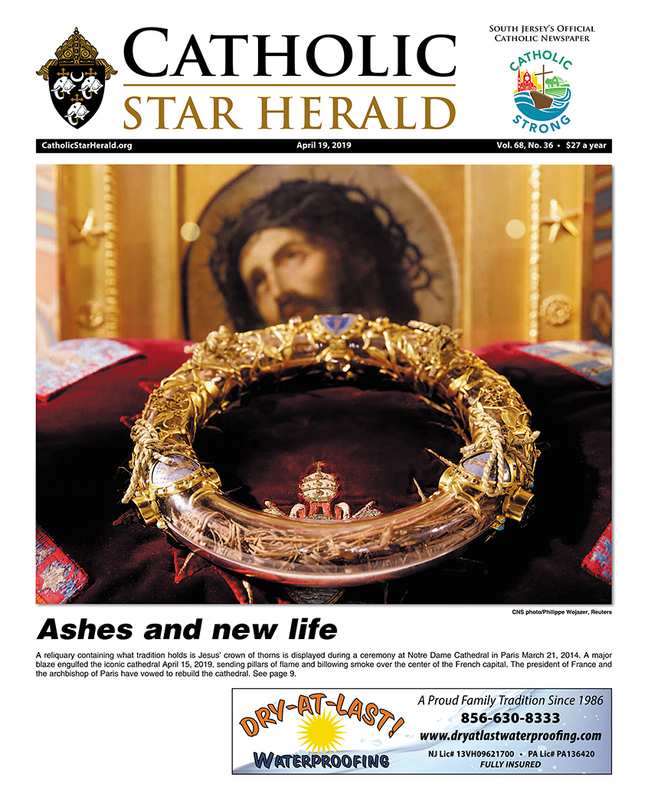 In the case of Father Friel’s parish, money raised will go toward such projects as the hiring of a part-time bilingual youth and young families minister, and improved lighting inside and outside the church campus. 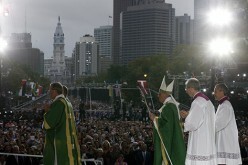 “The people bought in” to the parish’s future, Father Friel said. 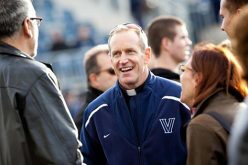 Father Robert Pasley, rector of Mater Ecclesiae Chapel, said he was “ecstatic” at his congregation’s response, as at press time Mater Ecclesiae Chapel raised $475,750, after a goal of $400,000. 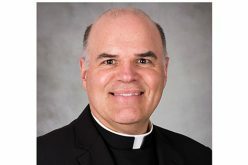 “The main reason that this worked is that the people are committed to the faith,” and their desire to see Mater Ecclesiae “continually proclaim and preserve the traditions of faith, that they want their children to have,” Father Pasley said. From a goal of $205,000, the Cathedral of the Immaculate Conception raised $218,780, and is planning on such initiatives as hiring a director of Faith Formation, and putting a new roof on Mount Carmel Hall, with other renovations as such to make it a space for overnight retreat groups. Also aiding in the accomplishment of these three parishes goals, was the enthusiasm and dedication of each community’s volunteer campaign team. Each committee member from each parish made an individual gift to Catholic Strong. 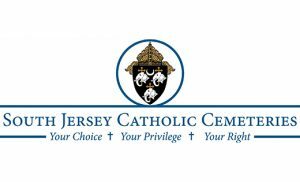 The success in Berlin, Camden and Pennsauken are examples of the parish’s “willingness to partner” with the Changing Our World team, said Shawn Trahan, one of the campaign directors from Changing Our World, Inc., fundraising consultants working with the diocese and parishes during this Catholic Strong campaign.